Congratulations to Carolina Moncion for an Honorable Mention of her paper Improved Probes for Fully-Passive Wireless Recording of Neural Activation by the 2018 IEEE International Symposium on Antennas and Propagation and USNC-URSI Radio Science Meeting. Congratulations to Arash Moshkforoush for placing second in GSAW presentations! Lecture by Dr. Jorge Riera at the BACI conference in the Netherlands, 1-5 September 2015! Dr. Jorge Riera is a speaker at the International conference on clinical and multimodal imaging (BACI conference) to be held at the Netherlands from 1-5 September 2015. 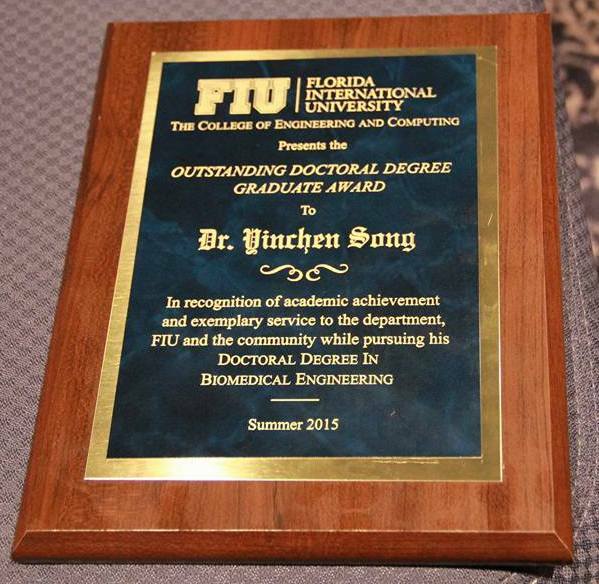 Yinchen Song wins outstanding PhD award from the BME department at FIU! 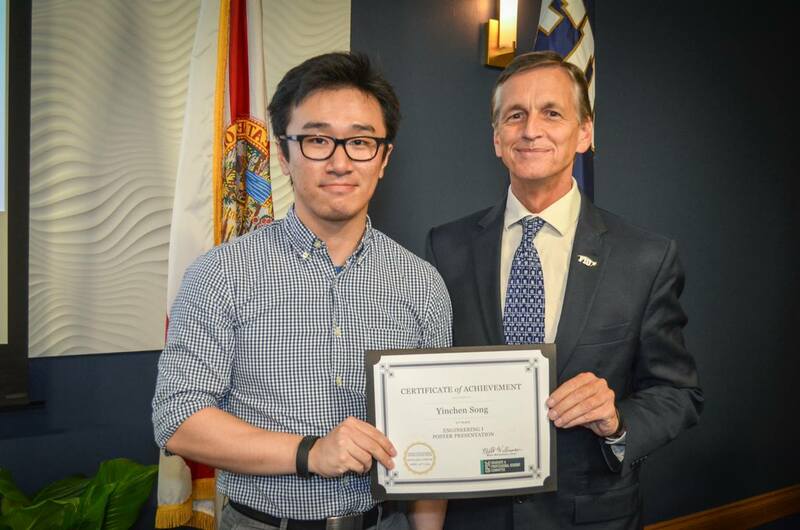 NMD Lab PhD graduate Yinchen Song has won the outstanding PhD award from the BME department at FIU during the Summer 2015 ceremony. Congratulations Yinchen on this amazing achievement! Course on fMRI and data analysis by Dr. Jorge Riera at Latin American Training program, 10-15 August 2015, Mexico! Dr. Jorge Riera will be conducting a course for students at the Latin American Training program at the Universidad Nacional Autonoma de Mexico from 10-15 August 2015 at Mexico. Workshop by Dr. Jorge Riera at OHBM – 14-18 June 2015, Honolulu, Hawaii ! Brain Connectivity Workshop by Dr. Jorge Riera at University of California – San Diego, La Jolla, 10-12 June 2015! 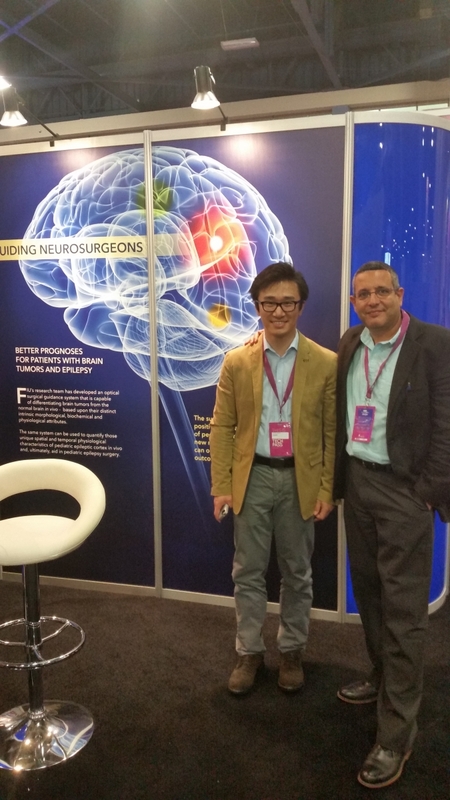 The Neuronal Mass Dynamics lab was one of the few labs selected for displaying their work at the eMerge Americas conference held on 4-5th May, 2015 at the Miami Beach convention Center. PhD students Yinchen Song and Lakshmini Balachandar presented their work and received appreciation for it. 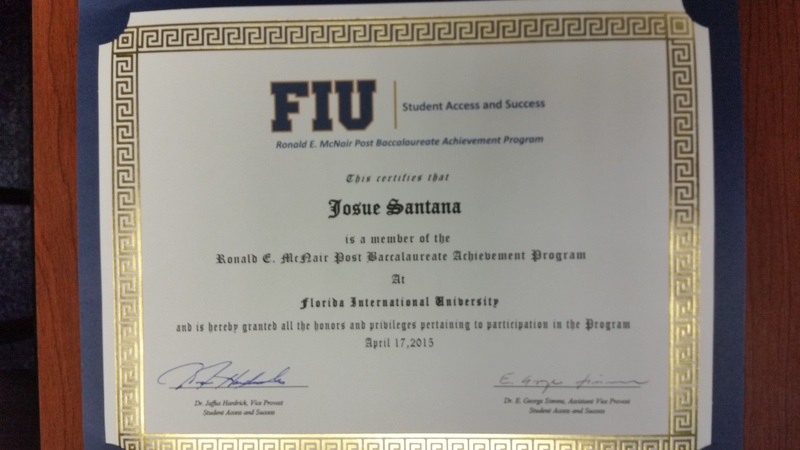 NMD lab member Josue Santana receives the prestigious McNair fellowship at FIU! Josue Santana, a student at the NMD lab and the Department of Biomedical Engineering has been inducted into the very prestigious Ronald. 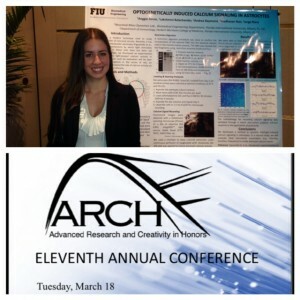 E. McNair Post Baccalaureate Achievement Program at FIU. 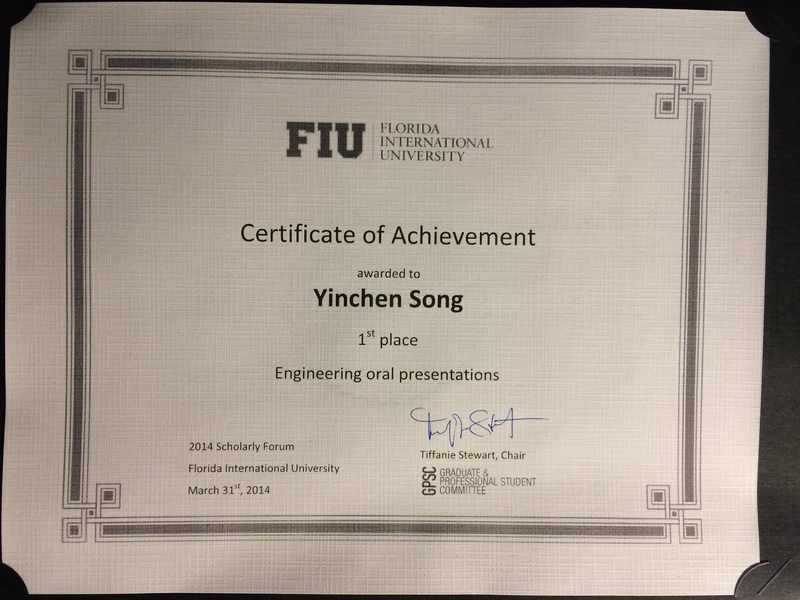 Yinchen Song wins 2nd Place at the FIU Scholarly Forum 2015! NMD Lab PhD student Yinchen Song has won the 2nd place at the poster presentation session at the FIU Scholarly Forum held in April, 2015. 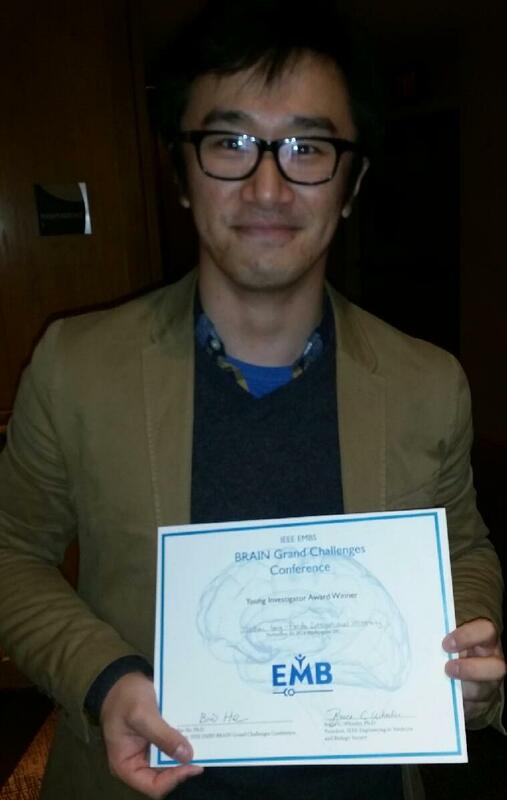 Yinchen Song wins Young Investigator Award at the IEEE EMBS BRAIN Grand Challenges Conference! Yinchen Song was selected as one of the thirteen winners of the Young Investigator Awards (YIA) among nearly 200 participants at the IEEE BRAIN Grand Challenges Conference held at Washington, D.C. from 13th – 14th November, 2014. This award was open to students, postdocs, assistant professors, or equivalent, and outstanding young investigators working on Brain Research through Advancing Innovative Neurotechnologies Initiative (BRAIN).For the conference, he presented a poster on the most important results obtained using the preclinical model of focal cortical dysplasia, primarily done at the NMD lab. Congratulations Yinchen for the outstanding achievement! 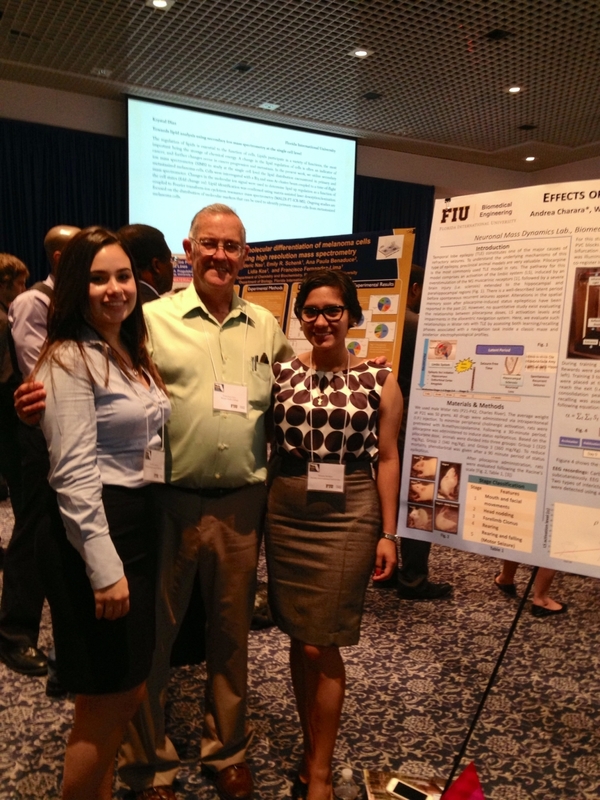 Lakshmini Balachandar wins 1st Place at the 4th Annual Graduate Research Day at FIU! 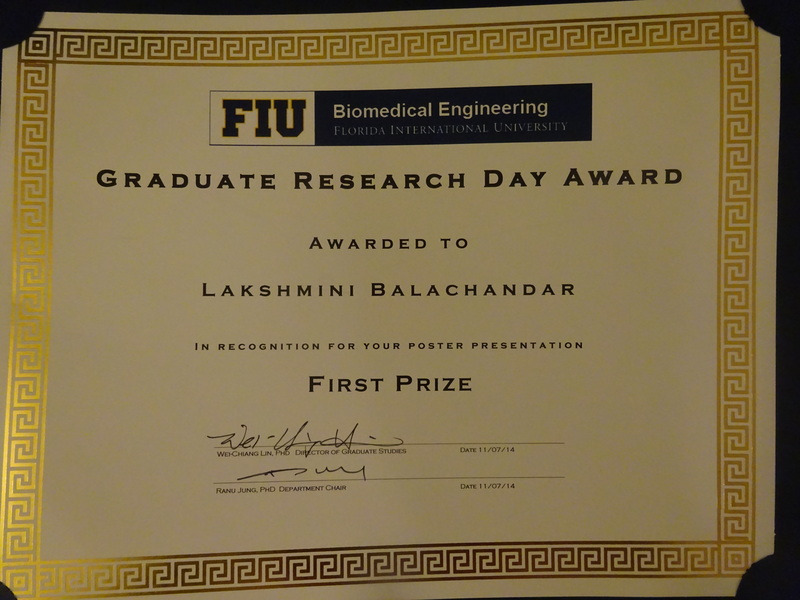 Lakshmini Balachandar won the first prize for her poster presentation on “A Quantitative Evaluation of Optogentically-Induced Calcium Signaling in Astrocytes” at the 4th Annual Graduate Research Day held by the Department of Biomedical Engineering at FIU. NMD lab members at the Society for Neuroscience 44th Annual meeting – 2014, Washington D.C! 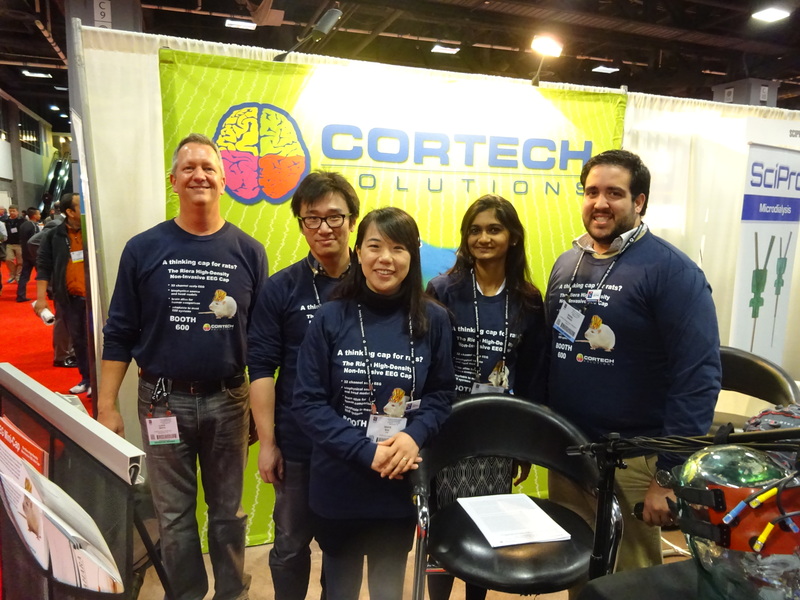 NMD lab members – Dr. Jihye Bae, Yinchen Song, Lakshmini Balachandar and Ralph Torres attended the Society for Neuroscience Annual meeting at Washington D.C. from 15th-19th November, 2014. They presented posters and were highly appreciated for their research. The conference was also a platform to unveil the “Riera High density non- invasive EEG Mini Cap”, which is now a commercially available EEG cap for rats, a patent of Dr. Riera. It was marketed by Cortech Solutions at the conference. Exciting new collaboration with Autism-U! Autism-U, a company specializing in autism treatment is currently working with the NMD Lab as a means of developing techniques by which Autistic children can be treated via interactions specially designed for children! 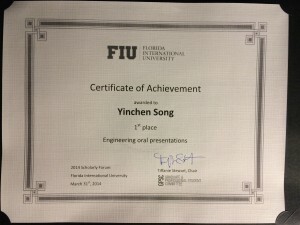 After successfully presenting his research within the oral presentation category at the FIU Scholarly Forum Yinchen Song secured the first place award. Congratulations Yinchen on the excellent accomplishment! On Tuesday March 18 Anggie Ferrer and Ralph Torres presented posters at the Eleventh Annual Advanced Research and Creativity in Honors Conference. Both undergraduate students received excellent feedback on their research projects. 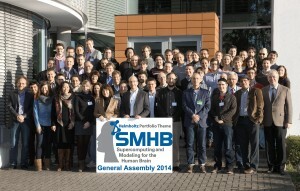 Doctoral Student Receives Award from Organization of Human Brain Mapping! Congratulations to Yinchen for this excellent achievement! Post Doctoral Researcher selected for the Korean American Scientists and Engineers Association (KSEA) Professional Development Workshop in Chicago! Jihye Bae Ph.D was selected and provided full funding to the prestigious Korean American Scientists and Engineers Professional Development Workshop in Chicago. The meeting supports the career development of Korean American Scientists and seeks to expand the horizons of its members. This is a fantastic opportunity for Jihye and our lab! Jose Matteo was awarded a position within the prestigious University of Ottawa Summer Computational Neuroscience program for 2014. 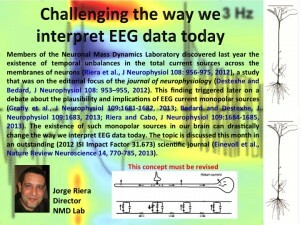 The work performed in this program will serve to continue to drive our computational edge in the Neural Mass Dynamics Lab. Congratulations Jose! 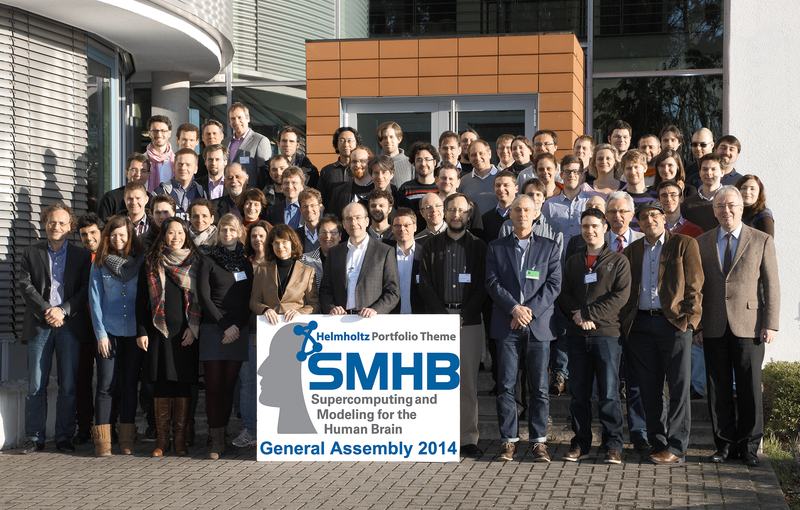 As a member of the committee for the Human Brain Project Dr. Riera and his lab are the forefront of the international developments in this field. Look forward to many new updates and collaborations. The Neuronal Mass Dynamics lab is not only a powerhouse of graduate research but also houses some of the most talented students at FIU. Four of these students presented posters at the National FURC Conference. Investigation by Dr. Jorge Riera Sparks International Debate! When we consider the dynamics of neuronal processes at the mesoscopic level the usual treatment leads us to discard monopolar source terms when performing a multipolar expansion for the electric fields that lead to EEG. This discovery lead to a multinational discussion with many groups and has sparked a new interest in finding the means to validate the existence of these monopolar sources! Jose Matteo has won the Bridge to the Doctorate Fellowship! Congratulations! Yinchen Song has won 1st place overall in the Graduate Research Day poster competition!